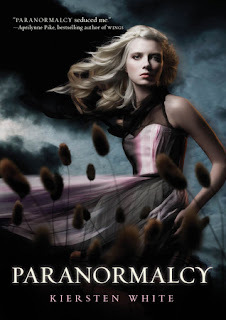 Hopelessly Devoted Bibliophile: Nightshade Winner and Paranormalcy Giveaway! Courtney Rae at Courtney Reads!!! You're the winner of Nightshade. Yes indeed, you get to dive into the awesomeness that is Andrea Cremer's masterpiece. NOW THEN..... a new giveaway shall we? This giveaway is for a finished hardcover book that I have an extra copy of! I was lucky enough to be sent a personalized copy, so now I have an extra one to share with all of you, my oh so fabulous readers! - You do not need to be a follower to enter, however please consider it. I love my followers and it's the easiest way to keep up with the random giveaways that I do! - Fill out the form below to enter. Entries received in the comment section will not be counted. Again, please take the shipping into account. I love leaving things open to my International friends, but I'm on a tight budget when it comes to shipping. Thanks for working with me! Giveaway ends October 31st at 11:00 PM PST! Any comment on a post that was published in October is good for 1 extra entry. Leave 3 comments, get 3 extra entries! Go comment to your hearts content!